Here the basic colour theory in the color wheel is explained. There are 12 hues of the spectrum including warm and cool hues, primary, secondary and tertiary colors. There are three primary colours which are, Red, Yellow and Blue. These colours cannot be made from any other colours. The triangle that they perform on the colour wheel is called the primary triad. Orange, green and Violet form the secondary triad. Please visit the website www.colors-4life.com for any other additional information that you would like to know about on this topic. This extremely well presented video tutorial teaches the viewer all the necessary steps to achieving long realistic looking hair in pencil. You will gain the correct ideology with respect to tones, shading and specific areas of where light and dark should be portrayed. The drawing is completed and narrated in a step by step approach, sometimes with the use of a quick shade multi tool on Photoshop to show you the direction of where the drawing should be expected to go. Easy to follow and very thorough. This is a great video tutorial for learning how to paint mountains in oil paints with artist John G Heinrichs. He begins with explaining his paint mixture for a base coat for the mountains and it consists of prussian blue, crimson,titanium white and ivory black. It is then ‘turned over’ with a palette knife which in oil painting is a technique known as ‘marbling’ to blend all these colors together loosely. He then loads the palette knife with paint on one side and applies it to the canvas by pulling the knife down to form the tops of the mountains. The next step is using a 2 1/2 inch Alexander art brush to feather out the bottom of the mountains in a blending style. There will obviously be a directional sunlight cast on the mountains so again the palette knife is loaded on one side with his titanium white oil paint and lightly applied with no pressure to the sunny side of the mountains. The canvas texture helps this process to form very natural looking cracks within the mountain side. The opposite technique is then performed to the shaded side of the mountains but only with a more ample application of prussian blue oil paint. The painting is then finished with the 2 1/2 inch brush being used to drag up the white oil paint from the misty bottom to create a more natural painting. 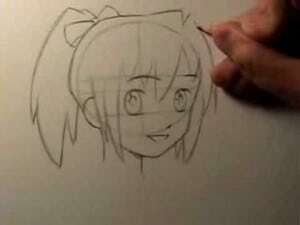 �A very easy to learn from art tutorial. This short video tutorial shows the sequence in which this particular artist uses to achieve a misty forest with breaking sunlight. 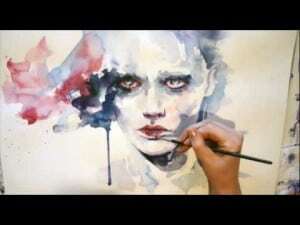 He begins with the background using a selection of brushes to manipulate the acrylics keeping them a nice soft shade. He then comes on to the foreground where the darker colors are used to contrast with the hazy backdrop and give the impression of a misty morning. Narrated throughout, so easy to understand. Brought to you by the kind people at ‘Expert Village’ this presenter/artist shows you the important of shading with charcoal to�ascertain form and weight within your subject matter. Shading is important because it gives your subject life and reality so it is vitally important that you are not shy with the charcoal and you almost attack your picture in the darker shaded spots. It really is a case of draw what you see because if you fail to add appropriate shading you run the risk of having flat looking objects or ones which appear to be suspended in a limbo. It is better to shade more in my opinion and it is also extremely important to be accustomed with the light source or direction of the light which essentially casts the shadows on your objects or subject. Have fun and play around and don’t be shy with that charcoal!